As we are all very much aware, everyday there are new companies coming up and those companies which are not up to the mark in terms of services and products are usually left behind in the rat race. Surviving in the business world is quite a tough feet and companies understand the importance of delivering top quality work against all odds. The success of a company rests upon, not merely the boss who heads the company, but also the employees who are integral part of any company. This having been stated soft skills are something which need to be present in not merely office employees but individuals belonging to various other fields as well. Each individual has his or her own emotional intelligence quotient. This quotient alters from one person to the other. Individuals who have a low emotional intelligence are usually very hard to not merely work with but also get along with. A person’s soft skills are related to his emotional intelligence. As opposed to hard skills which are not merely more tangible but also easier to measure, soft skills are rather ambiguous and difficult to assess or measure. It is only after spending a significant period of time with an individual and noticing his manner of speaking and expressing himself, one can gauge his emotional intelligence and see how well his soft skills are developed. Based on how an individual interacts with other individual, one can gauge what soft skills the person has. Not everyone is born with all soft skills and these soft skills can be acquired without much trouble. Some people are able to pick up soft skills with just a little training where as there are others, who no matter how much they try are just unable to develop the soft skills. It is mandatory to have atleast some soft skills if you want to achieve success in your professional life. Soft skills presentation are not only needed on the professional front but are needed to help in your daily interactions as well. When speaking of soft skills, it does not merely mean one thing it encompasses a number of different things which together make up an individual’s personality. Very broadly speaking it means the social manners which an individual has, how he is able to think as well as process new information which is given to him, how effectively he is able to communicate with others, language skills and even whether or not a person has leadership qualities. People who have these soft skills are indeed much sought after in any job field. If teachers wish to have a powerful impact on their students and make their classes lively and memorable it is vital that teachers have soft skills. Without proper soft skills, they will be unable to have proper classes and deliver their lectures in a proper manner. As we all know, students have a very low attention span and their attention needs to be attracted by the use of innovative techniques. A teacher who has soft skills will be able to modulate her voice and even make charts according to the need of the moment so that students are able to grasp the maximum amount of knowledge. Soft skills are things which cannot be taught via a book or by a long lecture. Students need to improve soft skills by observing their teachers. If teachers are exemplary examples for their students then the students grow up becoming exemplary individuals who are able to make a success of their lives and also contribute very positively to the society in which they live. It is vital that all teachers who are hired on board to schools are able and skilled individuals who know the important roles which they have to play in the students’ lives. It is for this reason why recruitment methods have to be absolutely strict and top notch. Students are young individuals who are very impressionable and it is for this reason, that the teachers who are entrusted to take care of them and teaching skills should be very able and abounding. It is important for teachers to have soft skills, because if they do not have soft skills, then they will never be able to give the students lessons and lectures according to their respective ages and cognitive ability. Their lectures will either be too high-flown, where it will go straight above the students heads or it will be of an inferior quality consisting of things which students already know at that level. Teachers need to be good leaders and command respect so that their students listen to what is said to them and obey instructions which are given. If a teacher is frivolous and unable to have a serious and stern manner then students are going to end up becoming rather undisciplined. Having soft skills is vital for teachers so that they can be good leaders who are able to lead the students from the front and in turn encourage the students to become good leaders themselves. Lessons taught in school do remain with children long after their schooling has been completed and that is why the teachers must be chosen with uttermost care. This having been stated it does not imply that the students should shy away from sharing any issue or problem with their teachers. Teachers should function as advisors and a guide for their students and it is only if they have soft skills that they will be able to guide the students along the right path and give them useful advice. Teachers should not be so aloof that the students feel afraid to approach them when going through a problem of any kind. It is very important that teachers have soft skills, because if they are lacking in soft skills, they will not be sensitive to the needs of those students. There are often silent students who need to be encouraged so that they come out of their shells and in addition to that there are other students who need to be given extra attention. It is only a sensitive teacher who has high emotional intelligence that will be able to look below the surface and differentiate one child from the next. No two children are alike and teachers should understand that. Man by nature is a social animal. It is right from school that children are taught to interact with one another, from a very young age. If children are not trained to be well mannered at a young age, then it wont be long before others start avoiding them. Social etiquette is something which is very important indeed. Soft skills are important for children as it helps them to make friends and form a meaningful relationship with others. Those children who have trouble interacting with others are never able to enjoy the company of friends or peers. Having friends is something which is very important indeed. The primary reason why students attend school is so that they can gain knowledge and learn new things. It is vital that students have soft skills, because if they do not have soft skills, they would not be able to understand the lessons which are being taught to them and they would not be able to imbibe everything which is being said. It is their language skills as well as their cognitive ability which allows them to process new information, arrange it in a proper manner and make sense of it as best they can. Based on the students’ ability he or she understands things and remembers them in his own unique manner. In the course of their school life, students are required to give a number of presentations. Right from a young age, students are encouraged to come forward and answer in class and even speak the minds on topical issues. Therefore, these important skills for students, because they require them at times like this, when they need to form opinions and deliver these opinions, supporting it with adequate arguments as well as examples. Students ought to be encouraged from a very young age to form an opinion and stand up for what they believe in. At regular intervals there are exams conducted where students have to prepare adequately and write down answers according to the questions which are being asked. No matter how much they know, if students are unable to comprehend the questions and answer to the point, they will never be able to attain good marks and do well on the academic front. It is for this reason, that having soft skills is very important so that they can express themselves in a proper manner and write answers which are able to impress the examiners who are reading the answer scripts. Communicating with customers is something which almost all employees have to do on a daily basis. Back office jobs aren’t always as well paying as front office jobs. People who have soft skills are able to build a good reputation for themselves and are also able to take the company to new heights. The success of a company is to a large extent dependent on such individuals who are able to successfully make clients into investing into the company. Without investors running a successful business is indeed a near impossible task. This is one of the primary reasons why soft skills are important for employees. For any company to run as a well oiled machine it is mandatory that all the employees work as a team. Working together always yields better results than working individually. 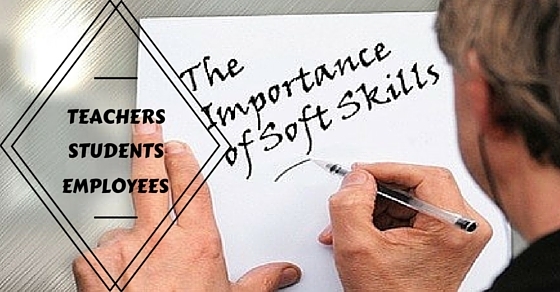 Soft skills in the workplace are very important for employees because they need these skills when it comes to communicating with their co workers and working as a proper unit. Soft skills are also important to employees as they need it when it comes to sharing ideas with their seniors. Those who speak up and give out of the box ideas are able to impress the management of the company a great deal. Those who shy away from giving responses rarely make it big in the business world. These are some of the chief reasons why soft skills are necessary for employees as well as both teachers and students. It is not very easy to acquire soft skills, but it has been noticed that those who have soft skills often excel in whatever field they might choose to be a part of. So if you are an individual who is lacking on this front, then you ought to seek some help from a skilled professional. Many companies as well as schools, organize programs, seminars as well as training sessions for their employees so that they are able to develop their soft skills and thereby improve their interpersonal relationships with other people.